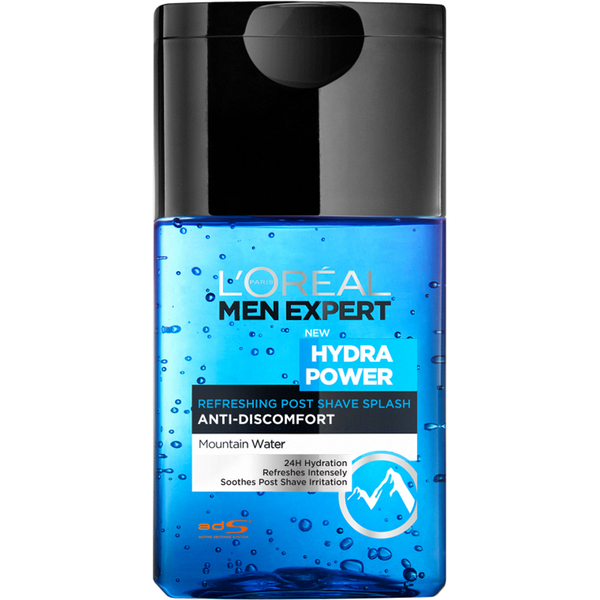 Indulge in a transformative exfoliation experience with the L’Oréal Paris Men Expert Hydra Power Refreshing Post Shave Splash. Sensitive and resourceful, the gentle aftershave naturally and diligently protects skin, helping to soothe burning and irritation. Powered by Mountain Water, layered with intense levels of fluid, the fast-acting formula works to reinforce the skin’s innate resistance barrier, preventing build-up of impurities and clogging. The lightweight gel instantly turns to a loose lather on application, allowing for immediate restoration and renewal. Use daily all over the face after shaving on cleansed skin. Aqua / Water, Propylene Glycol, Alcohol Denat., Glycerin, PEG-20, PEG-8, Butylene Glycol, Panax Ginseng Extract / Panax Ginseng Root Extract, PEG-60 Hydrogenated Castor Oil, Bis-PEG-18 Methyl Ether Dimethyl Silane, Potassium Hydroxide, Carbomer, Chondrus Crispus Extract / Carrageenan Extract, Ethylhexylglycerin, Phenoxyethanol, CI 42090 / Blue 1, CI 60730 / Ext. Violet 2, Linalool, Parfum / Fragrance.